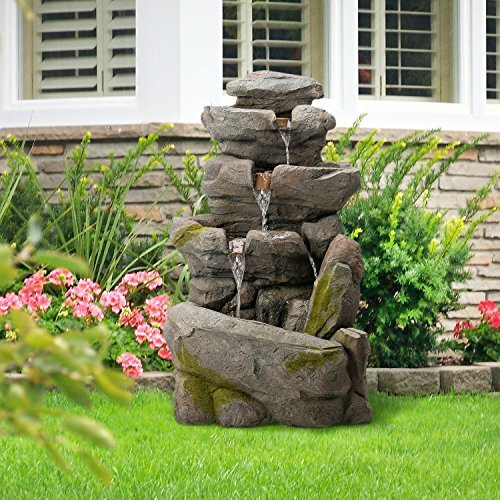 Diensday Rock Waterfall Fountain with LED Light，39.4" H，Lighted Cascade Waterfall, Natural Looking Stone and Soothing Sound for Patio and Garden Décor | Fountain City Art Ctr. distracting ambient noises and helping raise alertness and focus. - Dimensions 22.8W x 17.7D x 39.4H in. - Durable Materiel Selection: Strong poly-resin construction is lightweight for easy movement. Allowed years to use. - Weathered Finish: Natural rock design,smooth dark gray stone finish, perfect for any scene. - 4 Tiered Classical Lighted Design: Water recirculates,Bold, sleek design with peaceful feel,Floor style with cascade effect through 4 tiered bowls. Comes with LED lights to add to the ambiance at night. - Indoor Outdoor Use:Powered by standard outlet,For residential use outdoors and indoors. - Warranty&Includes: One year factory limited warranty, ETL-certified pump included.Some assembly required. If you have any questions about this product by Diensday, contact us by completing and submitting the form below. If you are looking for a specif part number, please include it with your message.